Mark Theodore Hasselberger, 53, of Linthicum, passed away on April 3, 2018 at his residence. Mark was born on August 11, 1964 in Baltimore to the late Joseph Theodore and Fannie Nadine (Flanary) Hasselberger. He was the third of five children born into a loving family, he enjoyed the typical relationships that young children have with their siblings. Mark attended St. Phillip Neri School and graduated from Andover High School class of 1982. He became a tractor trailer driver and enjoyed transporting art all across the country. He later became a welder. 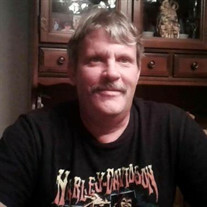 Mark enjoyed history, fishing, music, but most of all being with his family and his friends. Whenever in a group, he was sure to be the life of the party. Marks first name was providential as his grandmother would say he left his mark everywhere he went and the significance of his life can be judged through the mark he left on the hearts of those he loved. He was preceded in death by his daughter, Angel Hasselberger; parents; paternal and maternal grandparents. He leaves to cherish precious memories his daughter, Katie Hasselberger; son, Michael Magaha; siblings, Marie Bauerlien (Dennis), Joseph Hasselberger, Irene Broch (Kevin), Michele Hasselberger; a host of loving nieces, nephews, other relatives and special friends. The family will receive visitors at Singleton Funeral & Cremation Services, P.A., 1 2nd Ave. SW (at Crain Hwy) on Mon., April 9th, from 3-5 & 7-9 PM. A time of reflection and sharing will take place at 8:30 PM during the visitation. A Mass of Christian burial will be celebrated on Tues., 10 AM, at Holy Trinity Catholic Church in Glen Burnie. Interment Glen Haven Memorial Park. Memorial Contributions can be made to a recovery program of your choice.